Question: How can we disseminate so as to eliminate fear? Answer: When we go out to disseminate the integral method to the public, we never talk about anything negative. It’s forbidden for us to frighten them in any manner or way; for they will only scatter in all directions from hearing “bad” words. We always talk about good, about happiness, and love, about how we want to attain it. There is no need to direct people towards seeing what is bad, arguing to convince them that it will be even worse. It’s wrong to do this, this is not a healthy approach, not from love. On the contrary, we want to elevate them, give them more than what there is now. Is it good for you? It will be even better. Is it bad for you? Even so, it will be better! We need to think only about how to approach them with everything good so that they will happily meet us. Certainly we must know from the start which problems they have so that we can start a conversation, but only in the beginning and then pass immediately to what is better. Certainly a person could say: “I don’t need anything, everything is okay with me, leave me alone.” We need to learn how to talk with him in this kind of condition without causing negative feelings. We must learn how to be positive all the time; we should only be in the right line. If this is developed in a person, then it will show the left line. Question: How can we prevent the propagation of personal fear when disseminating? Answer: If you are going to disseminate for the group and the Creator, then personal fear disappears. The group is behind me. The Creator is found together with us. In front of me is the world or some individual, it doesn’t matter. Who is he? He is also the Creator. It turns out that in front of me and behind me is the Creator. The world doesn’t exist; the world is my own reflection within me. 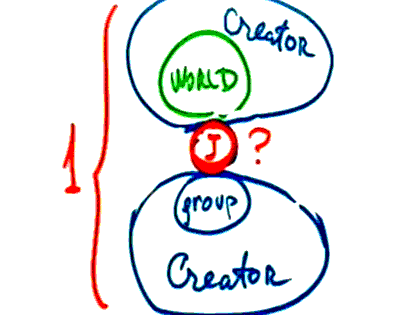 There is no group and there is no Creator. This means all of it, even the reflection within me. I need to bring all of it to this to the fact that there is none else besides Him. If I act like this, I won’t have any fear. In working with people, I know that I am now standing before the Creator who is playing with me in this way. On the other hand, I turn to Him, and, at the same time, I adhere to the Creator found behind me. This is because everything was created so that I would connect the entire world through me in all of its diversity with the only power that controls the entire universe, with the power of bestowal and love. And then I will discover Him; He will be revealed to me.